CNBC Africa broadcast an All Africa Business Leaders Awards (AABLA) Southern Africa highlights special on 6 October at 7pm on DStv Channel 410. 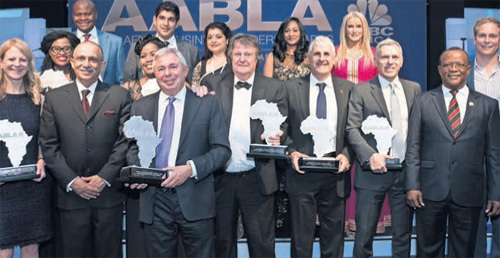 The awards recognised Africa's bold leaders of business in East, West and southern Africa. The southern African winners were announced on 29 September and will go on to compete against their peers from around the continent in the All Africa Grand Finale, to be held on 11 November in Sandton, Johannesburg, where an overall winner will be announced. "This is for every young African girl who has a dream," said the Young Business Leader of the Year — Southern Africa winner, Linda Olagunju, founder of DLO Energy Resources. Identifying gamechanging business leaders in a variety of categories, the 2016 All Africa Business Leaders Awards, in partnership with CNBC Africa, recognise the diversity of the African business landscape, and the Johannesburg leg celebrated those who have forged and helped shape the southern African business world. The evening was hosted by CNBC Africa's Gugulethu Cele and Alexander Leibner. • The Lifetime Achievement Award Southern Africa went to Founder of Bid Corporation, Brian Joffe. The next leg of the awards will take place in Lagos, Nigeria on 20 October.